Chris McGrath | Getty Images A banner of Turkish President Tayyip Erdogan. Turkey’s collapsing currency and reeling economy have fallout for other emerging markets and expose vulnerabilities at some European banks, but strategists do not now see it as a trigger for a broader banking or financial crisis. Just a few European banks were identified as major investors in Turkey, but their exposure was not seen so severe as to trigger another banking crisis in Europe, strategists said. But emerging markets, already suffering from a stronger dollar, rising interest rates and global trade friction, could remain under pressure, and the flight from Turkish assets could make the exodus from the weakest EM countries worsen. Stocks sold off around the world, the U.S. dollar rose to its high for the year, emerging market currencies fell, and investors sought safety in U.S. Treasurys and German bunds. The euro fell 1.2 percent to just under $1.14, a 13-month low The Dow was off about 200 points in afternoon trading, and the U.S. 10-year yield, close to 3 percent earlier in the week, was at 2.87 percent Friday. Yields move opposite price. 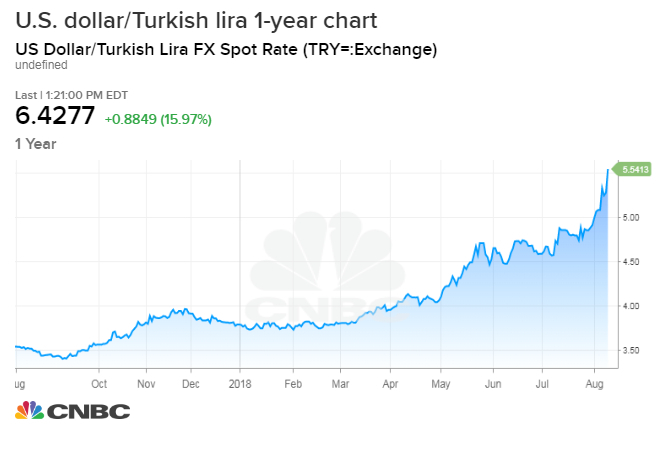 The lira, now down 80 percent against the dollar in the last year, plunged double digits Friday, as President Recip Tayyip Erdogan failed to reassure investors, and in fact made the exodus from the currency even swifter when he appealed to Turkish nationalism and asked citizens to dump dollars and gold, in exchange for lira. The Turkish lira’s decline accelerated even further Friday after President Donald Trump authorized the doubling of metals tariffs on the country, coming on top of U.S. sanctions already in place in response to Turkey’s refusal to release American pastor, Andrew Brunson, who was swept up in a crackdown after the 2016 failed coup attempt against Erdogan. The lira was down as much as 20 percent at one point, and was later trading about 17 percent lower. In remarks Friday, Erdogan appealed to his people and railed at the west, claiming outside forces will not be able to “crush this country.” He also reportedly said: “Interest rate plots are no different than a military coup attempt.” Erdogan, who now has defacto control of the banking system, has refused to raise interest rates, as the currency spiraled. Turkey has been caught up with other emerging markets, as major global central banks, particularly the Fed, move away from easy money policies and remove some of the liquidity that had flooded the global economy since the financial crisis. “We’ve seen global central banks’ balance sheets tighten and we’ve seen the emerging markets, as Warren Buffett would say, swimming with no clothes on,” said Mark McCormick, head currency strategist, North America at TD Securities. He said the problems will show up in the weakest economies, like they did in Argentina for example. But strategists said Turkey’s problems are unique, and one of its big problems now is that Erdogan acquired broad new financial powers in the June election, and that has been a negative for the economy and undermined investor confidence. “At the heart of this is their priorities. Fiscal policy was too loose and monetary policy was too loose. Growth was far too strong at 7 percent last year. When you have growth like that, you have a buildup of vulnerabilities. Imports grew faster than exports, making Turkey quite dependent on foreign lending. That created a fragile situation,” said Jackson. European bank stocks were under pressure Friday, with the biggest investors in Turkey among the hardest hit. The euro dipped to its low of the year against the dollar as investors worried Turkey’s financial woes would turn into a contagion forcing the European central bank to resort to emergency measures. Turkish sovereign bonds also sold off with the 2-year yield rising to about 24 percent and the 10-year yielding more than 22 percent. Other currencies also sold off with the South African rand down more than 2 percent and the Russian ruble off 1.5 percent at a new, more than two year low against the dollar. Strategists said a story in Friday’s Financial Times highlighting the European Central Bank’s concerns about three large lenders to Turkey helped fuel the selling in the European banking sector. The article said the Single Supervisory Mechanism, which monitors banks for the ECB, has been looking more closely at ties to Turkey in the past couple of months. The banks mostly affected are Spain’s BBVA, Italy’s Unicredit and France’s BNP Paribas, all of which have operations in Turkey. “It looks like its confined to a few banks and its doesn’t look like it poses systemic risk, though of course given the FT report, today’s not the day to be long European banks – even the innocent,” said Marc Chandler, head of fixed income sstrategy at Brown Brohers Harriman. Unicredit holds a more than 40 percent stake in Turkish bank, Yapi Kredi. Earlier in the week, the bank said Yapi Kredi’s performance was good and that it could absorb foreign exchange losses, according to the FT. That was before Friday’s steep decline in the euro. Likewise, ‘BBVA was reported to say Garanti Bank, of which it owns nearly half, was well prepared for the situation. BBVA shares were off 5 percent Friday, and BNP Paribas declined 3 percent. “[Erdogan’s] going to hang tough, appeal to god, blame the United states and troll everybody by making these grand announcements about having conversations with Putin and striking deals with Iranians on something…The only country that can help them outside of the west and these financial institutions is China. Let’s see what China does. To me that’s critical,” said Cook. Erdogan said he spoke with Russian President Vladimir Putin Friday, but it’s unclear what role Russia will pay. The U.S. meanwhile, remains a key. That pressure on Turkey could continue to weigh on emerging markets. “There’s a lot of negative stories. We’ve had the trade war…China’s economy is now slowing, so it bodes poortly for emerging markets as an asset class,” Jackson said. Chandler said markets are now looking to Asia, and there could be further weakness early Monday. He expects pressure to remain on emerging markets. “This is like a 100-year flood for Turkey, but what do you do in a 100-year flood, buy more flood insurance? The quant models are going to show this has been extreme moves, but I don’t think that alone is going to seduce people to try to pick a bottom,” he said.